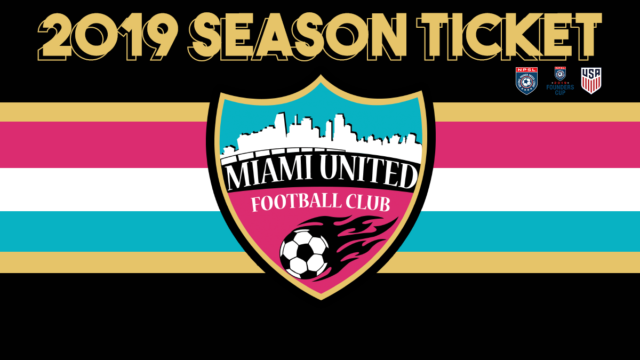 Buy your Miami United FC 2019 Season Ticket and enjoy more home matches than ever! On a visionary act, Miami‘s oldest club in the modern era has stepped up by adding to the NPSL Regular Season the highly-anticipated NPSL Founders Cup. The Founders Cup is a team effort from the NPSL and 11 founding clubs trying to start a reshape in the professional soccer landscape within the league. Miami United FC plans to play at least 10 home matches, International Friendlies & Playoffs matches which will all be included in your 2019 Season Ticket. An (1) Official Team Jersey and an extra 20% discount in our in-Stadium Merchandise Tent are other benefits of this offer. You can buy your Season Tickets Here! Adding to the ever-green effort of continuously connecting with our community Miami United FC also has accommodated the Season Ticket Price for kids (from 6 – 12). Also, as a demonstration of the club‘s ongoing gratitude for our men & women serving in any of the military branches, the team has announced a 25% discount will be applied on individual tickets (when presenting their Military ID) starting this season.